Over the past year I’ve worked on a transformation program which involved a lot of stakeholder consultation. One of the forms that this took was a series of workshops to both understand current state and co-design future state. I’m going to use my Working Out Loud (WOL) page to reflect on these workshops and what I learned as a result of designing, co-designing and working with the workshop outputs. I don’t have a series of posts mapped out, so this exploration will jump around a bit (and may be interspersed with WOL posts on other topics). My goal is to extract the best of these ‘half-baked’ reflections into a better-crafted post on my main blog on this website when I am ready. This program focussed on Learning and Development (L&D) activities in a large organisation with decentralised L&D teams. The lessons I’d like to draw out are not specific to the L&D function; some will also be applicable beyond organisational transformation. To provide context I will start in this post by mapping out the series of workshops. Preceding these workshops we had undertaken a deep dive into L&D activities in a number of business units to identify what was working well, and opportunities to improve results and efficiency. The workshops expanded participation to representatives from all L&D teams and internal customers (represented by managers and subject matter experts). As shown in the image below the workshops were conducted in three waves, moving from high level to greater detail. The overall purpose was to define an effective, efficient future state operating model, informed by an understanding of customer characteristics and needs, solutions to meet these needs, and capabilities required to develop and deliver these solutions. 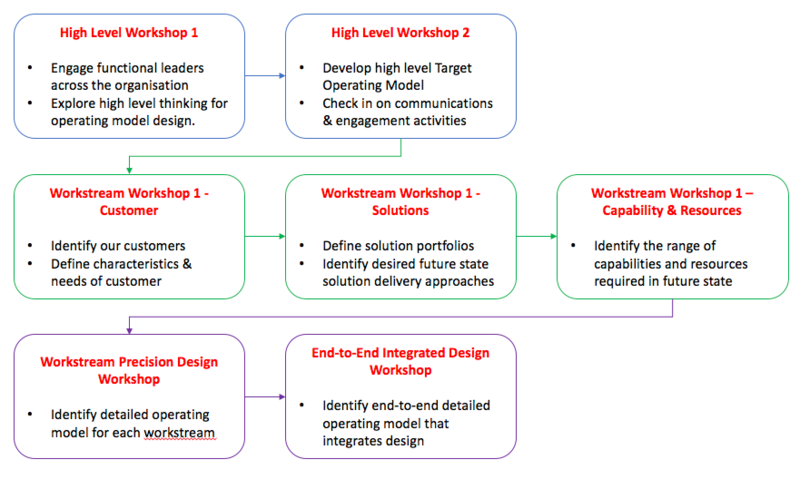 The work stream workshops in the centre row and the workstream precision design workshops were all run multiple times to accommodate 6 ‘solution portfolio’ workstreams plus workstreams for a further 3 value chain activities. The total number of workshops conducted was between 25 and 30. WOL Note – Yesterday I tweeted about the excuses we use to defer being creative. The source of this tweet was a fabulous little book called ‘Your Inner Critic is a Big Jerk‘ by Danielle Krysa. I decided to get back to my Daily Dispatches on my WOL page to overcome the excuse of ‘I don’t have enough time’ and ‘But it’s not good enough to post.’ Hence this bite-sized post as a start point for unpacking how I’ve worked and what I’ve learned through these workshops. This entry was posted on October 4, 2017, 3:25 am and is filed under L&D Transformation, Working Out Loud. You can follow any responses to this entry through RSS 2.0. You can leave a response, or trackback from your own site.